The Territorial Force Nursing Service (TFNS) was created in 1909 as a sister organisation to the Queen Alexandra’s Imperial Military Nursing Service (QAIMNS), to support the Territorial Army. The TFNS was made up of civilian nurses working in civilian hospitals who would volunteer their time to work in military hospitals, and eventually overseas. Over 7,000 women served in the TFNS during the First World War in about 25 UK based hospitals, hundreds of auxiliary units throughout the British Isles and eventually 18 overseas territorial hospitals. These women were awarded a number of medals for their efforts, including the 1914-1915 Star, the British War Medal and the Victory Medal, plus one of the rarest First World War campaign medals, the Territorial War Medal. 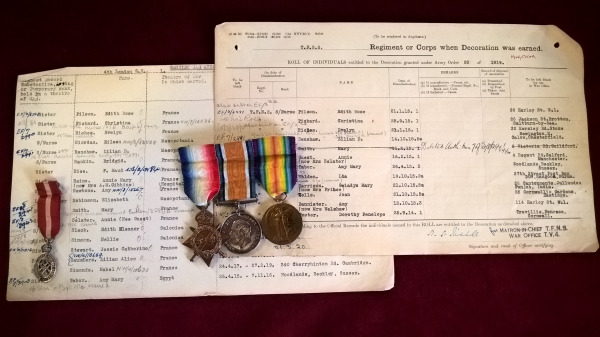 Now, Forces War Records is pleased to present the transcribed medal rolls for TFNS women awarded the above decorations, handily searchable by name and exclusively available on the Forces War Records website and at the AMS Museum. The two organisations have worked together to ensure that all records were transcribed as accurately as possible, having originally collaborated to digitise the National Archive’s rare ‘War Office: First World War Representative Medical Records of Servicemen’ collection for the very first time. It was thanks to this close relationship that Phil Cooper had been invited to rummage through the AMS Museum’s archives, in the hopes that some other collection of interest to genealogists and suitable for transcription might come to light. Indeed it had! 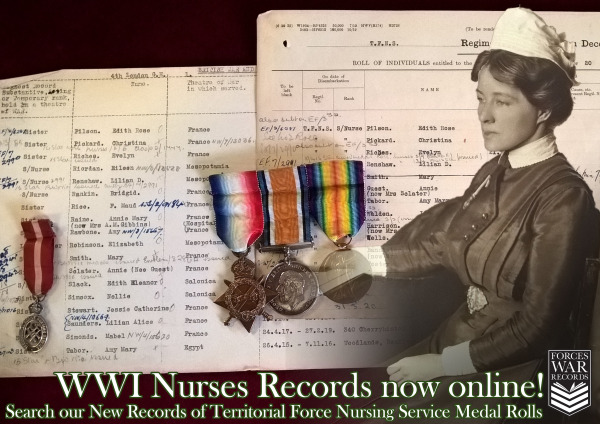 These new records contain a lot more information than the TFNS records currently held on Ancestry or at the National Archives – they show nurses’ first name(s), address details, in some cases where the nurses were based and where they served, including dates of service. They also give married and maiden names and awards such as the Royal Red Cross along with additional comments. They are from a later date than the currently available records, which is perhaps why they contain more fields.